– Memory – Life is Good! (An imaginary conversation between two Cub Scouts a month before the pack pinewood derby race). Johnny: What ya’ got in that baggie in your pocket? David: These are my pinewood derby wheels. I’m “marinating” them in graphite so they will go faster. Johnny: That’s silly! What you really want are grooved axles. They reduce friction. David: No they don’t! But you can reduce friction with a raised wheel. Johnny. I don’t think that reduces friction, but I think if you angle the axles so that the wheels run on one edge, you’ll reduce friction and go faster. David: Hah, where did you hear that one? On Car Talk? Really, I think the main thing is “aerodynamism”. You know, like race cars. Johnny: You mean “aerodynamics”. But that doesn’t do anything at slow speeds. But we do have a super secret lube we are going to use this year that will let us win the council race. David: Oh really! There’s no such thing — you know that “Lemon Pledge” isn’t the silver bullet don’t ya’? Johnny: It’s not Lemon Pledge, trust me. But we’re also going to put the weight in the front of the car so that it gets moving faster. David: That won’t help. Lightweight wheels are what you need to get the car going faster. Besides, my dad is a science teacher, and he says that weight doesn’t matter because of some guy named Newton. Johnny: Well my dad’s an engineer, and he says that weight does matter. We’ll just see whose dad knows more after “I” win the race. David: You mean after “I” win the race! Which of the boy’s statements are true, or are they simply a myth? Is Johnny or David’s dad smarter? I can’t answer the last two questions, but I can certainly take a crack at whether any of Johnny or David’s statements are fact or fiction. Over the past several years, I have run across quite a few pinewood derby myths, and have experimentally confirmed or busted many of them. So in today’s article, we will review the main pinewood derby myths and label them as confirmed, plausible, or busted. Graphite reduces friction when applied to the wheel to axle contact surfaces (wheel bore, inner hub and outer hub). There is also a slight benefit to coating the inner edge and tread surface of the wheel with graphite — see Volume 8, Issue 2 – October 15, 2008. Obviously, there is no benefit to coating the non-contact surfaces such as the inner and outer walls of the wheel. So, the question is whether immersing the wheels in a bag of graphite is more or less effective than purposefully placing the graphite on the contact surfaces. In my testing I have found that graphite is most effective when it is worked into the contact surfaces by repeated spinning (or similar). Just placing graphite on the contact surfaces is not sufficient; the graphite must be worked into each surface. So, simply placing the wheels in a bag of graphite (even if the bag is massaged around the wheel) is a less effective technique than purposeful application of graphite. In Volume 8, Issue 6 – December 10, 2008 we discussed grooved axles at length. From that discussion we learned that grooves do not reduce friction (the friction is just relocated). However, we did find that grooves can be of benefit in specific situations. When running on BSA-type nail axles, grooves were of benefit with both graphite and liquid lubes. But when running with oversized axles, the advantage/disadvantage of grooves was indeterminate. Contrary to David’s statement, raising a wheel does not reduce friction (the frictional forces are just increased on the other three wheels). However, there are other benefits to a raised wheel including a reduction in wheel inertia. In Volume 4, Issue 14 – April 6, 2005 a raised wheel experiment was conducted which showed a significant benefit to racing with a raised front wheel (see Figure 2). Confirmed – One point to David for knowing that it helps, one point to Johnny for knowing that it does not reduce friction. The term “canted” means an object set at an angle, thus “canted axles” are axles which are attached to the car at an angle. Sometimes this is done accidentally, but usually car builders cant axles in an attempt to reduce the amount of contact between the wheel tread and the track. In Volume 8, Issue 8 – January 8, 2009 a canted axle experiment was documented. The results show that up- canting the rear axles on an aluminum track may provide a very slight benefit. In Figure 3 the amount of change between the data points is within the statistical variation of the heat times, so the data is inconclusive. As it applies to pinewood derby cars, aerodynamics refers to the affect of air flow on the movement of the car. Johnny is correct that the effect of air flow on a vehicle does increase at higher speeds, and decrease at lower speeds. But does the effect go away at pinewood derby speeds (10 to 15 MPH average)? In Volume 3, Issue 9 – January 21, 2004, an aerodynamics experiment was documented. In this experiment, the frontal surface area of a car was varied with a removable air dam. The results are shown in Figure 4. As you can see, an increase in frontal surface area does reduce performance for a pinewood derby car. The use of an effective lubricant is critical to car performance, and there are certainly a vast number of possible lubricants that can be used. These include dry powders, liquids, and liquids that become dry to the touch. After all of these experimentation, I have found that a good quality graphite (such as Max-V-Lube) or a good quality synthetic oil (such as Krytox 100) gives the best performance. So, is there a super secret lube? I can’t absolutely confirm or bust this myth, but I don’t believe there is a secret lube. If there was, it would not remain secret for very long, as it would be publicized on the Internet and be available from pinewood derby stores such as ours. There are likely other lubricants that rival the performance of Krytox 100 and Max-V-Lube, but I don’t believe there are lubes that are significantly better. The location of the ballast weight on a pinewood derby car affects the center of gravity (generally referred to as the “balance point”). The optimal balance point varies from track to track, but that position is somewhere between the center of the car and the rear axle location (1 to 1-1/4 inches in front of the rear axle location is a good rule of thumb for most tracks). In Volume 3, Issue 14 – March 31, 2004 a weight experiment was documented. In this experiment, the balance point was adjusted from the front to the back of the car. The results are shown in Figure 5. As you can see best performance was attained with a rearward balance point. In recent years, lightweight speed wheels have become readily available. These wheels are weight-reduced by removing excess plastic from the interior of the wheel. Reducing the weight of the wheel reduces wheel inertia – the tendency of a wheel to not spin. So, lighter wheels should provide a faster start for a car. In fact, this has been proven to be true. In Volume 7, Issue 3 – October 31, 2007 a wheel weight experiment was conducted. The results of the experiment show that reducing the weight of the wheels (and adding that weight to the car) does improve performance (see Figure 6). While Sir Isaac Newton is credited with the “discovery” of gravity, it was Galileo that showed that the mass of the object did not affect the acceleration of the object due to gravity (true in a vacuum). However, on a pinewood derby track there are other factors at work. Most pinewood derby tracks today have a sloped section (where gravity accelerates the car), and a flat section. On the flat section, the momentum of the car, aerodynamics, and friction are among the factors that affect how fast the car slows down. Momentum is based on speed and mass, the heavier the mass, the greater the momentum. So, heavier cars tend to hold their speed for a longer period of time, and thus tend to be faster. In Volume 3, Issue 14 – March 31, 2004 a car weight experiment was conducted. The results of the experiment show that increased weight improves the performance of the car (see Figure 7). A similar test with weight beyond five ounces was documented in Volume 7, Issue 5 – November 28, 2007. Well the debate between Johnny and David ends in a five to five tie. But now that you have the facts, you will be better armed for your next race (or pinewood derby debate). Good luck, and may the best car win! 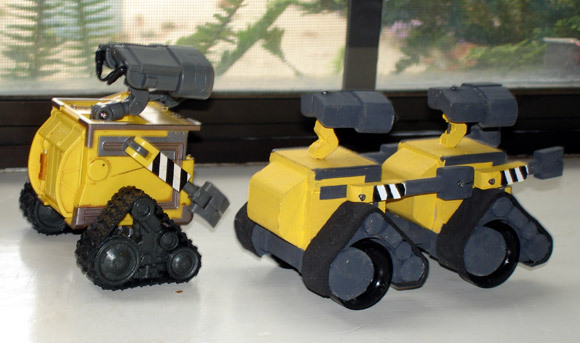 To build the WALL-E tandem car, I used a standard size pine wood block and cut it into two cubes. I kept the original axle slots for mounting the wheels, and attached parts from a toy caterpillar with 1-1/4″ wheel cut-outs (made with poplar). Most of the other parts (head, neck and arms) were made of poplar. 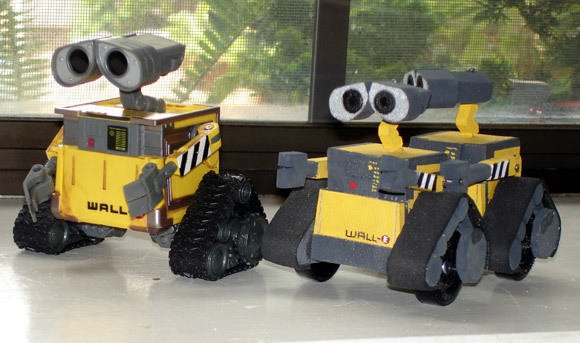 After completing the two identical WALL-E’s, I connected them with two dowels. Some weight was added to the back and bottom of each Wall-e. Since the two parts were connected together, there was an alignment problem so it wasn’t very fast. But it was a fun project! Last summer Noah (my son) and I went to the MotorBooks car show, in Osceola Wisconsin. At the car show there was a replica of the Batmobile. 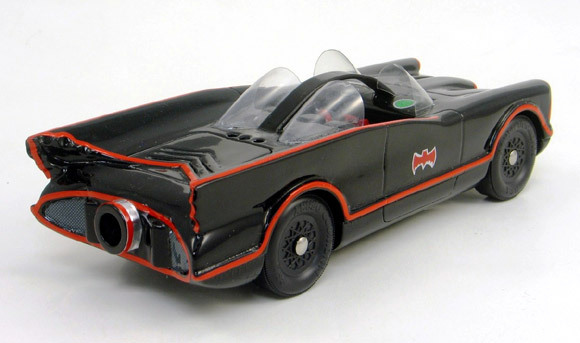 While we were discussing the Batmobile he asked if it was possible to build a Batmobile for his pinewood car for next year. 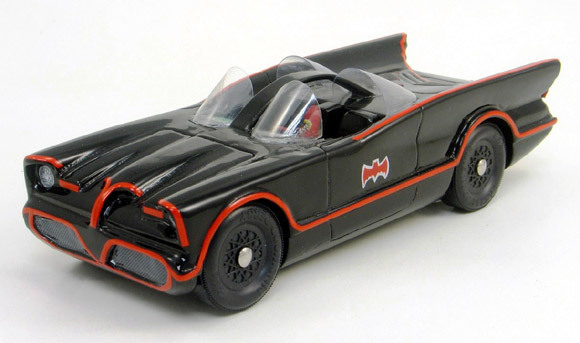 I love when he comes up with these ideas on his own so of course I said yes (not even thinking how hard it would be to create the Batmobile in pine). The windshield is made from the top of a 500ml (16.5 fl. oz.) Aquafina bottle. The plastic is recessed into the body, via a knife cut line and attached with a small amount of glue. During the racing I did not have a lot of time to view the races, but this year there was a lot of fast cars. When it came time for the awards Noah received 3rd place (technically 2nd for Webelos 1, as all Webelos raced together-10 racers total). This was the first year our pack gave out design awards (picked by all of the race spectators), and Noah received two – Coolest Looking Car & Best Painted and/or Decorated Car. Yesterday was Derby Day for our Pack here in St. Louis, Missouri. My son, Max, is a Webelos II and this was his last derby. Last year we had the pleasure of coming in First Place in the Webelos I race and winning First Place Overall in the Pack Finals. We have used your products for the last four years counting this year. This year was a little different. We have a Webelos II scout who lost his father a little over two years ago to cancer. He’s a quiet young man, but nice as can be. The last two years his uncle, and then another father, helped him with his cars. They were much more into design than speed and he finished well back in the pack so to speak. Sometime after my son won the derby last year, I asked Max if he would mind if we helped Eric build a car this year. I told him there was no assurance that I could guarantee which car would be faster and he might not do as well. I waited for his answer and it was more than I had hoped when he said, “It’s OK dad, we won this year and maybe Eric will win next year. Let’s do it!” Several months later we asked Eric and his mother if he would like our help, and he and his mother consented to this. Two other fathers offered also to help him, not to suggest this was any grand gesture on my part — although, I thought it was pretty special on my son’s part. Well, I helped the boys build two cars using the Maximum Velocity tools and parts we’ve acquired. We shaped the standard BSA block. When they were complete, other than the full body decals and the numbers on the cars, you really couldn’t tell them apart. We don’t have the opportunity to run the cars in advance in our pack, so we had no idea how they would perform. Well, Max won 2nd Place in the Webelos II Division and 2nd Place in the Overall Pack. There were 57 cars in the Pack races and 13 in the Webelos II Division. So to all you fathers out there, build them fast with Maximum Velocity parts and tools, but take time to share your knowledge. I believe my son has discovered the true meaning of being a Cub Scout and I hope your sons do also. All things being equal, can I build a faster car using tungsten instead of lead? For instance, using the basic wedge design, can we place weight in a more favorable position with tungsten? The goal of weighting is to get to the maximum weight, to get the desired balance point, and to focus the added weight in one spot (as much as possible). If you are using a more full-bodied car (including a wedge), these three goals can generally be achieved with lead. However, if you have a low-profile car will minimal wood, then generally tungsten is needed to achieve the weighting goals. Just substituting tungsten for lead will not create a faster car. Is there anything that would cause a car to start more slowly than others, but run faster at the bottom of the track? Your car is using a different lubricant than the other cars (some lubes start slow but work well once moving).